The Supermarine Spitfire Mk.V ruled the skies over Great Britain during the early years of the Second World War. It was able to match the Luftwaffe's best fighter of the day, the Messerschmitt Bf 109E. However, with the appearance of the Focke Wulf Fw 190A in the skies, it was quickly apparent that the Spit had finally been outclassed. Recognizing that a major upgrade to the Spitfire was necessary, the RAF set out to develop the Spitfire beyond the anticipated capabilities of the Luftwaffe. Also recognizing that such a major upgrade would take time, time that the RAF could ill afford, an interim solution was needed. That interim solution would become the Spitfire Mk.IX. By taking the existing Mk.V airframe under production, installing the new Merlin 61/63 series (which added 100-200hp and an improved supercharger) which turned a four-bladed propeller, and adding such refinements as a gyro gunsight, additional fuel tanks and the E-wing, the new Spitfire was able to regain its superiority in the skies over Europe. The Mk.IX was the second-most produced version of the Spitfire, with some 5600+ examples built. The most numerous version was the Mk.V. 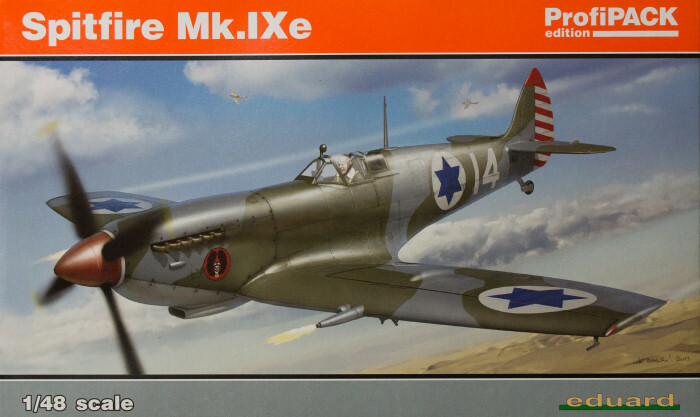 Eduard announced the Spitfire in 1/48 scale a few years ago and here is the latest installment: the Spitfire Mk.IXe. 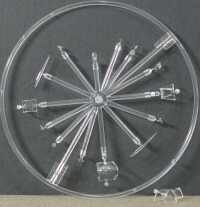 The kit is not as modular as some of the contemporary Hasegawa kits which reduces potential assembly challenges and unwanted gaps. Nevertheless, you can see in the parts layout that we could see the LF (clipped wing) and HF (extended wingtip) versions. The chin is also separately molded so we may see the tropical version as well. The decals are nicely printed and include a set of airframe stenciling. From what I see here as well as some of the build-ups already online, Eduard has produced probably the best Spitfire Mk.IX in 1/48 scale. Eduard already released a number of detail sets for their Spitfire kits when their Spitifre Mk.IXc was first released last year should you want to super-detail the engine bay, add a resin cockpit, and more. Check with your favorite retailer. In the meantime, here is the e-wing Spitfire Mk.IX ready for your scale flightline!